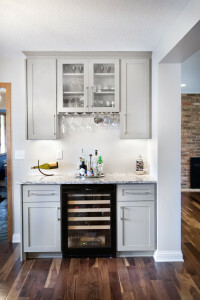 What Are the Realities of Working with a MN Custom Cabinet Maker? 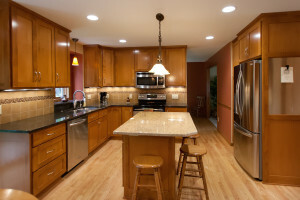 In our some of our latest blogs I talked about what is a Custom Cabinet Shop, and What to Look for in Custom Cabinets. In this blog I am going to address the realities of working custom cabinet maker. My focus on these blogs is to educate people about the pros and cons of working with a cabinet shop. It seems like 3 to 4 times a week we get phone calls to repair a cabinet door, replace a couple of cabinet doors, or other small miscellaneous jobs. I am going to use cabinet doors as an example to help explain the process. It is OK to contact your local cabinet shop about this. However, it is not as simple as driving out to the house and pricing out 2 doors. First, a budget can be established with a couple of pictures, and a brief e-mail. Why should we talk about budget first? First, small jobs are usually easier to complete if you know what you’re doing. However, the cost to complete is usually a sticker shock for prospective clients. Secondly, if a cabinet maker is pulled out of the shop, then cabinets are not being made. This is an expense that must be covered and passed along to the client. So, a cabinet door on a full set of kitchen cabinet might cost around $50 per door. Now, if you are looking for a couple of doors we would need to pull the cabinet maker off the current job, have him/her drive to your home measure the doors. Then come back to the shop, order materials, set up the equipment to make the doors, then complete a custom stain match. Sounds simple, correct? Simple can still be time consuming. The cost per hour for a small job can run from $85 to $150 a hour to complete the tasks above. In the end, between the labor and internal office time, the hours could easily be 16 to 24 hours. This is where the sticker shock comes in. The more leg work you can do as a client up front, the less time invested on our end, is one way to reduce the cost. This is only one example. Other calls we get is adjusting a cabinet to fit a new microwave, re-working a television center to take out the 80”s box TV and install a flat screen TV. All of this adds up to time and expenses on our end. At Artisan Cabinet Company we do want to hear from your all of your jobs. Whether it is a couple of doors, or an entire kitchen, bathroom vanities, or even custom built-ins. My goal is to align your expectations with ours, this is the start to a solid and positive relationship to care of your needs. Give us a call at 612.235.4873. We look forward to hearing from you.